Kansas City Chiefs quarterback Patrick Mahomes has received two more honors. On Wednesday, the Pro Football Writers of America announced it has named Mahomes as the NFL’s Most Valuable Player and the NFL’s Offensive Player of the Year for 2018. Mahomes — in just his first season as a starter — is the 45th MVP named by the PFWA, and the first member of the Chiefs to receive the MVP or the OPOY. 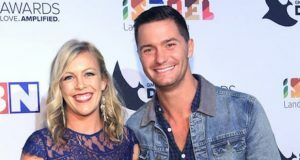 He is the sixth consecutive quarterback to receive the award, following Peyton Manning in 2013, Aaron Rodgers in 2014, Cam Newton in 2015, Matt Ryan in 2016 and Tom Brady in 2017. Mahomes started all 16 games in 2018, and he completed 383 of 580 passes (66.0 completion percentage) for a franchise-record 5,097 yards (second in the NFL), 50 touchdowns (tied for second in a single season in league history), only 12 interceptions and a 113.8 passer rating (second in the NFL) as the Chiefs won the AFC West and gained the AFC’s No. 1 seed with a 12-4 record behind a franchise-record 565 points scored (third in NFL history). He also led the NFL with a +38 touchdown/interception differential (50/12), 52 completions of 25-plus yards and 35 red-zone touchdown passes. He posted 10 games of 300 or more passing yards and tied the Chiefs’ franchise record with a pair of games with six touchdown passes at Pittsburgh in Week 2 and at the Los Angeles Rams in Week 11. He also rushed 60 times for 272 yards and two TDs. 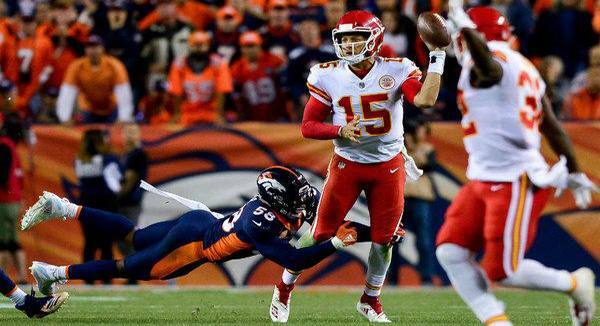 Mahomes was selected as the AFC Offensive Player of the Month for September, the AFC Offensive Player of the Week twice (Weeks 1 and 2) and was selected to the PFWA’s 2018 All-NFL and All-AFC teams. The vote for the big honor — the Associated Press Most Valuable Player for 2018 — has already been taken. The result will be announced at the NFL Honors ceremony the night before the Super Bowl. 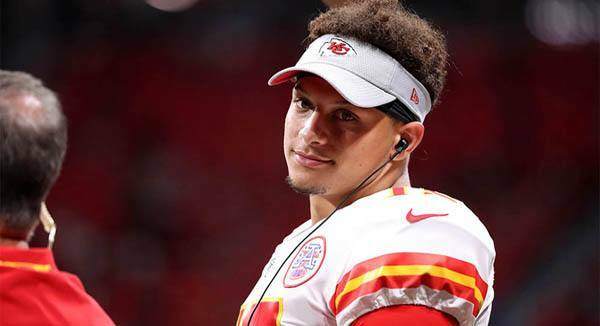 Mahomes is widely considered as the front-runner to win the AP MVP award, with Drew Brees also receiving strong support. This was the first season as a full-time starter for Mahomes, who after being selected in the first round of the 2017 NFL Draft started one game as a rookie after sitting most of the year as a backup behind Alex Smith. 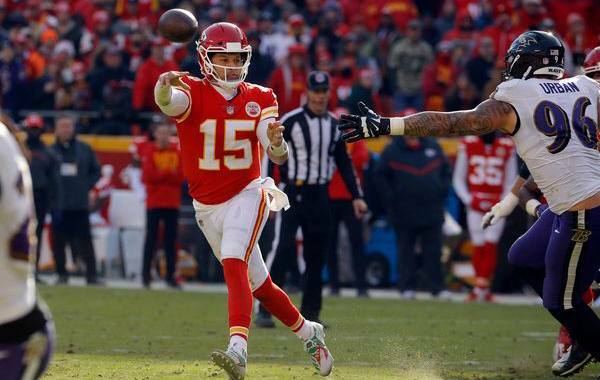 His performance went beyond expectations, as in addition to rewriting the franchise record books, Mahomes led the Chiefs to a 12-4 regular season record and a spot in the AFC Championship game. Mahomes also established himself as a team figurehead along the way, picking up where Alex Smith left off in terms of leadership despite being just 23 years old. Mahomes has become a favorite across the league, known for his no-look passes, left-handed passes, side-arm passes and other seemingly impossible acrobatic play-making. After leading the NFL in sacks, Los Angeles Rams defensive tackle Aaron Donald was named the 2018 Defensive Player of the Year.